Alex Oma-Pius is Artistic Director of IROKO Theatre Company, who are regular performers at the Museum. 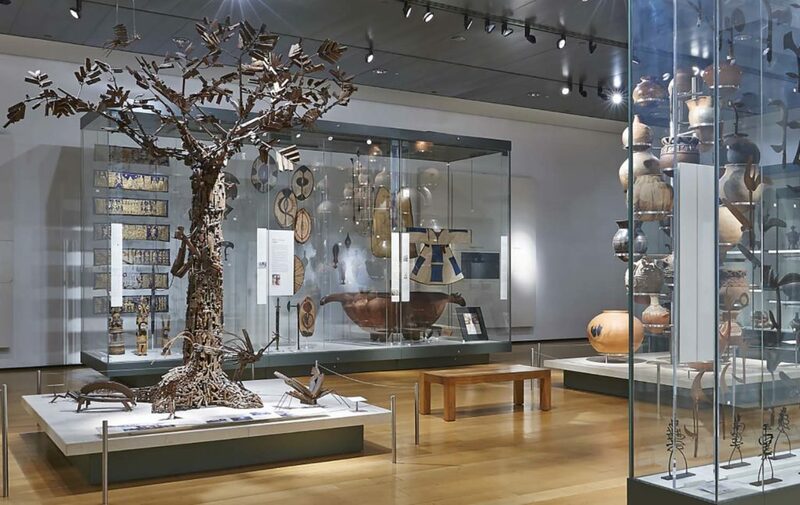 For Black History Month, he tells the stories of some of the highlight objects he's encountered in the Sainsbury African Galleries. 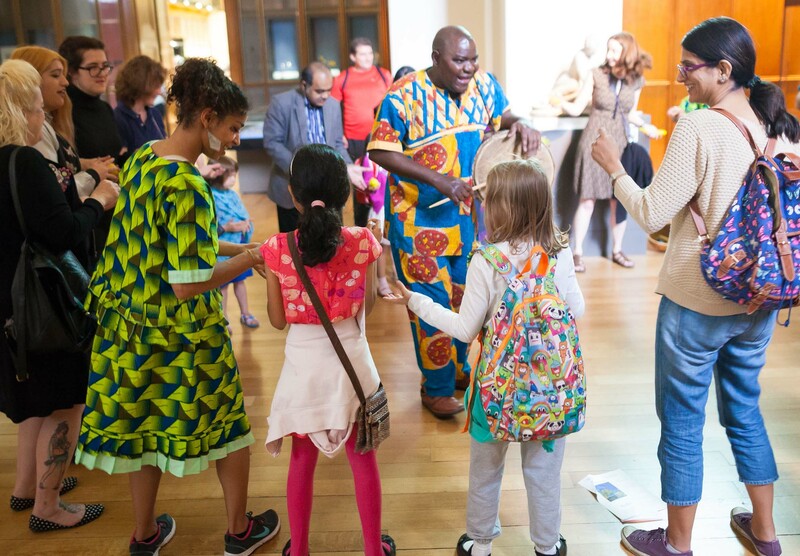 Once, I was taking a group of schoolchildren aged 9–10 round the British Museum’s Sainsbury African Galleries (Room 25). We stopped at a sculpture and I pointed out to the group that it is called the Tree of Life. The laughter that erupted afterwards still rings in my ears till today. ‘How can this be called the Tree of Life?’ asked one of them. A very good question indeed. Cristóvão (Kester) Canhavato (b. 1966), Hilário Nhatugueja, Fiel dos Santos and Adelino Maté, Tree of Life. Metal sculpture, 2004. Tree of Life is a piece of art that makes you stop and think. A superficial glance at it as you stroll through the galleries will show you a tree, its branches spreading in all directions and a small monkey climbing upwards. A closer inspection though, reveals a different story, for this is a tree that never ‘grew’ from the rich red soils of Africa. It is made from surrendered weapons used in the war that ravaged Mozambique for 17 years. The imaginative sculpture would more aptly have been named Tree of Death. Tree of Life never stops to amaze and inspire me. When I look at it, all I can see is a new beginning and the rise of Africa from the ravages of war. I see growth and how we can change a very bad situation to a positive and inspiring one for all. I see an Africa standing tall and strong again. For me, the branches of the tree symbolise the strong protective arms of a mother shielding her children and the habitat under the tree from further damage. 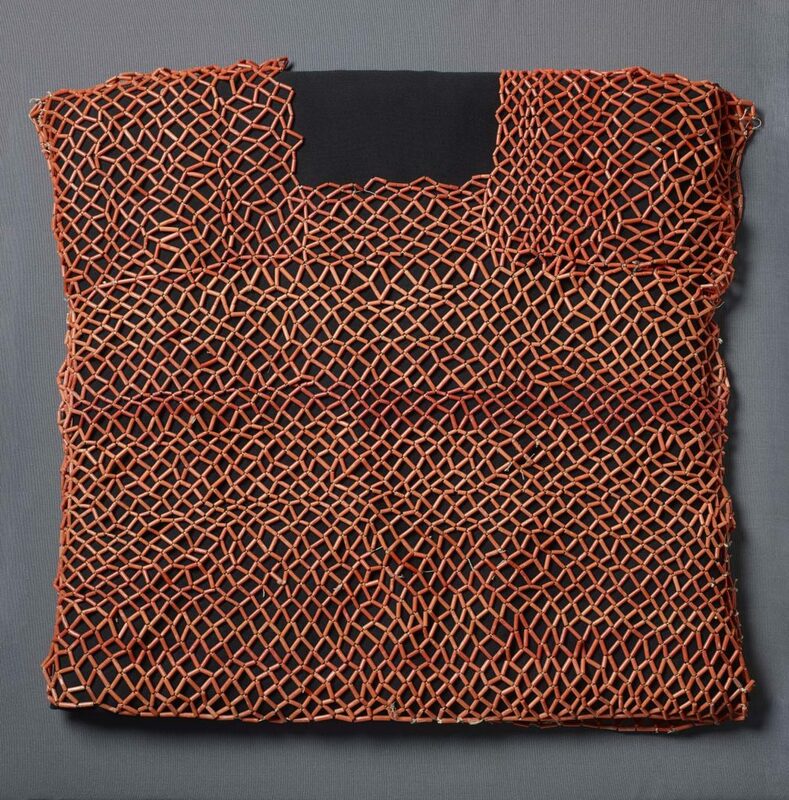 Corslet made from a mesh of coral beads on vegetable fibre. 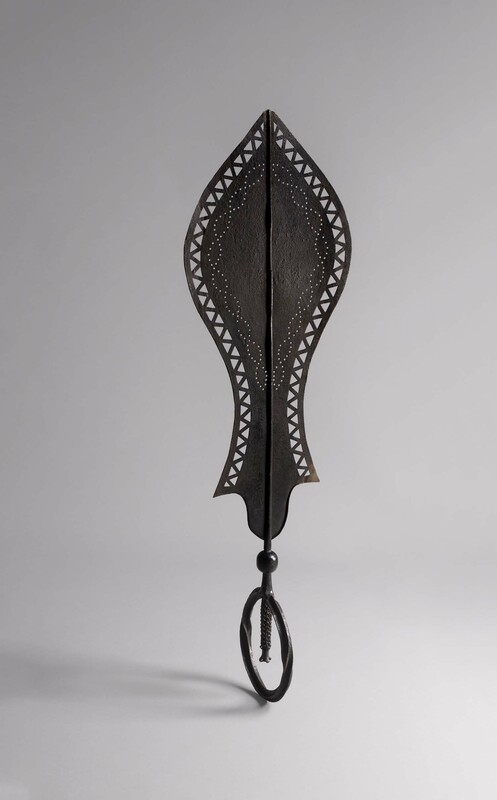 Made by Edo or Bini people, Benin, 19th Century. To a West African, coral beads symbolise wealth, prosperity and, most importantly, royal authority. They are also believed to contain supernatural powers and energy. ‘It must be uncomfortable wearing these beads’ was a comment I once heard during one of my visits to the African Galleries. It is surely difficult having one’s body laced in coral beads, but there is a good reason for doing so, especially among the Bini and Yoruba of Nigeria. In fact, coral is hugely popular in West Africa and is prized as much as gold. There is a saying among the Bini in Edo State that ‘a child surpasses beads’. To compare a child to the bead shows the high status that the bead occupies. The king wears coral beads like nobody else. He is adorned from head to foot in them. 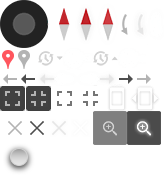 This is far from being adornments to enhance the appearance of the wearer. According to mythology, the wearing of the beads by the king is a deliberate act to constantly remind the king of the enormity of the responsibility he carries on his shoulders. The same is said too of a new bride wearing the coral beads around her neck as a direct reminder of the responsibility of marital life and of the authority of motherhood. Pair of leopards, made of ivory with metal inlay. Edo people, Benin, 19th century. © Her Majesty Queen Elizabeth II, 2017. Look closely at this figure and marvel at the craftsmanship that turned a piece of ivory into such an exquisite piece of art. I have always wondered how many hours were spent, meticulously shaping the raw material into this sculpture to make it fit for a king, fashioning the teeth and the whole body of the beast and with each spot carefully placed. Symbolising strength and royal power, this magnificent ivory beast would have adorned an Oba’s palace. So revered was the leopard that it even wears its own coral beads. A royal beast indeed. 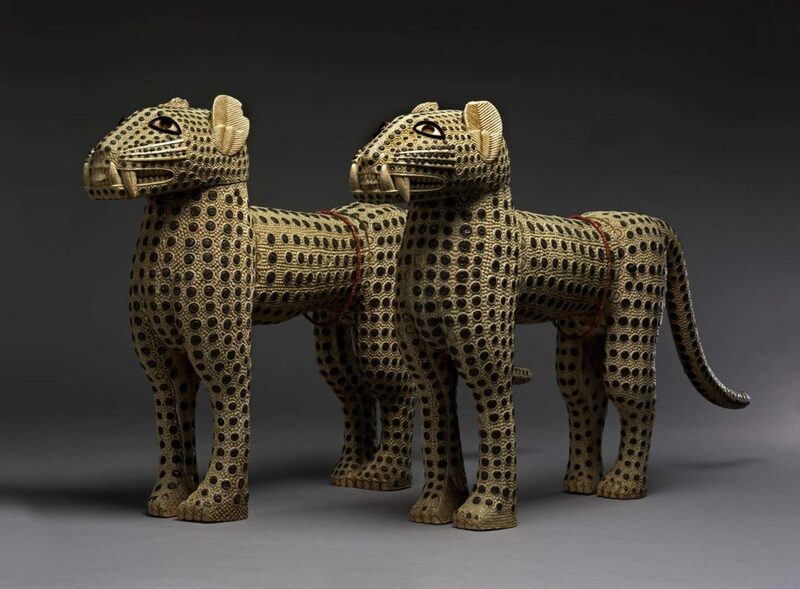 The leopard sculpture is often used to decorate the Oba (King) of Benin’s palace. Its presence in the Oba’s palace goes beyond mere symbol of power and authority. According to Benin mythology, the spotty leopard, like the coral beads, is a reminder to the king of the comeuppances of ignoring ones responsibilities. The leopard was claimed to have done so, and as a punishment it got burnt by fire. The resultant scars from the burns are the spots that are all over its body to remind it of the consequences of disobedience and that there are other forces more powerful than it. Iron eben, or chief’s ceremonial dancing sword. Benin,19th Century. I remember seeing an African theatre drama workshop where a replica ‘eben’, a royal sceptre from the Kingdom of Benin was used. It was perceived as a war weapon because the people running the workshops used it as a prop and failed to explain its significance to the young people. We explained the eben’s symbolic meaning to the young people and it was then that one of them, a Pakistani, made the cross-cultural connection between the shape and design of the eben and the Nalain (the slippers that the Prophet Muhammad wore on his way to see Allah). ‘I will hold the eben differently from now on,’ remarked the young man. If you saw the eben being carried aloft and coming towards you, you would know at once that the king was not far behind! Outranking the coral and the leopard, the eben (ceremonial sword) reigns supreme in symbolising the power and authority of the king. It is not an ‘ordinary’ sword. It is a royal sword, fit only for a king. 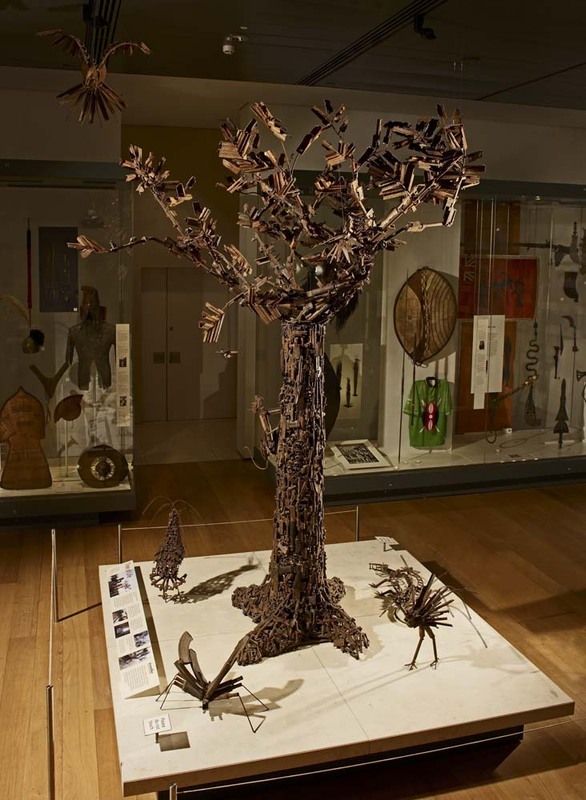 Go to the African Galleries and go beyond the ‘tree of life’, conjuring up its contemporary images of Africa. Stand awhile and marvel at the richness of Africa’s past and legacy and know that Africa is a continent worth discovering.